Winner: Feinberg & Associates; Robbinsville Township; Sharbell Development Corp.
From the early 1980s through the 1990s, Robbinsville (formerly Washington Township), like many towns, transformed from a rural, agricultural community into a sprawling residential suburb. What ultimately has become the Robbinsville Town Center sits adjacent to an older planned-unit development built in the early 1980s, as well as an established commercial area. Working with the township, principal developer and builder Sharbell Development Corporation, architect Feinberg & Associates and other members of their development team turned the initial concepts for this project into a mixed-use, traditionally inspired neighborhood built for today’s varying lifestyle needs. The team’s core goal for Robbinsville Town Center was creation of a walkable and friendly, yet diverse, community. Housing styles range from small-lot single-family homes to duplexes to townhomes and loft units, integrating many options as well as inclusionary affordable housing in the same project. The result has attracted a wide range of residents. The architectural details of the Robbinsville Town Center homes add to the project’s success. Many residences have spacious front porches that offer usable living space and encourage neighbors to mingle and socialize. Individual garages are located in the rear of each home, leaving a streetscape of charming facades. Robbinsville Town Center’s retail and office components work to create a vibrant mix of uses. Already, two-thirds of the existing office space has been leased, and many restaurants and retailers are open. This includes an upscale gourmet Italian deli/market, a day spa/salon, a sushi restaurant, a men’s shop, women’s boutiques and the new location of the Trenton landmark DeLorenzo’s Pizza, among others. The project has contributed significant green space to the Robbinsville community. A transfer of development rights allowed Sharbell to achieve its high-density building approvals and contributed to the preservation of 90 acres in another part of the township. Additionally, Robbinsville Town Center itself includes more than 20 acres of open space in the form of small pocket parks, larger public parks and two lakes encompassing more than eight acres. 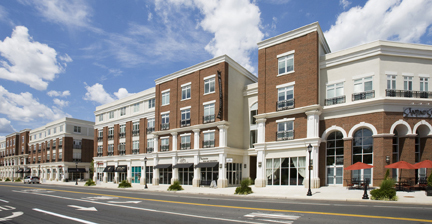 Robbinsville Town Center has been designed to be not only walkable but also accessible to public transportation. Residents can access office buildings, stores and restaurants on foot. Additionally, the development site sits directly on Route 33, with several public bus stops adjacent to the property. Sharbell Development Corporation is working with Greater Mercer Transportation Alliance and also is talking with NJ Transit about the possibility of shuttle service from Robbinsville Town Center to the Princeton Junction and/or Hamilton train stations.